Every fall we host Open House events for prospective students. These campus visits are the best way for you to experience what life at Fitchburg State is all about. Everyone should feel a sense of belonging at their school of choice. The Open House is a great way to come to campus and see how Fitchburg State feels to you. We look forward to this time of year because we love seeing prospective students walk around falling in love with everything we have to offer, from the campus to its faculty, staff and fantastic students, we’re so confident in our university we think you’ll love it, too! One of the most important parts of the Open House experience is the opportunity to meet representatives from the area of study you’re interested in. Whether you’ve already chosen a major or if you’re on the fence, this is a great way to get your questions answered and help you make your decision. Fitchburg State is more than campus classroom learning. You’ll learn about travel opportunities through our study abroad program as well as internships and community partnerships. You’ll also meet many of the campus clubs and organizations so you’ll see there’s no shortage of ways to stay involved. 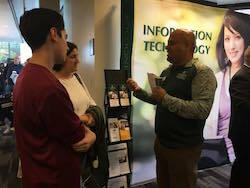 There’s no better way to get a feel for Fitchburg State than by speaking with current students. At Open House you’ll have the chance to do just that. From student government to Greek life and everything in between, you’ll hear it right from our students’ mouths. Our student tour guides represent another chance to learn how life here works, in addition to giving you an opportunity to see our beautiful campus. You’ll also have the option to grab lunch at our dining hall if you’d like. Open Houses are a lot of fun for everyone—prospective students, your families, and us! We hope to see you at one in the very near future. We’ll be sure to defy your expectations! Our last Open House of 2017 is Saturday, November 4.